With just a glance at a screenshot, it’s instantly obvious that a lot of effort has gone into Seasons After Fall. 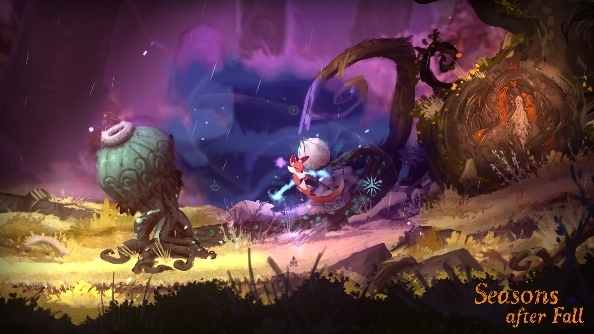 A gorgeous, painterly affair, its woodland evokes the likes of Ori and the Blind Forest and games from the ever-beautiful UbiArt engine. It’s been a labour of love for developer Swing Swing Submarine; one that’s had some setbacks, but is now on track for release this year. Looking for more artistic darlings? Try one of the best indie games. 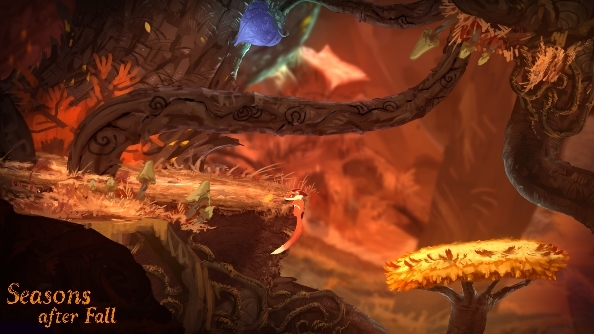 Development started in 2009, but problems with cash flow and the studio’s experience level caused the game to be put on hold. Years later, a deal with publisher Focus Home Interactive put the train back on the rails, and now release is just a few months away. But despite coming to us this year, Swing Swing Submarine have kept the real details of Seasons After Fall close to their chest. All we really know is it’s a game where you play a fox. Playing as a spirit during the opening section of the game, you’ll enter the body of the fox and imbue it with the power of the Guardians, making said fox magical and introducing the main mechanic: manipulation of the seasons. The seasons affect everything within the game world. Various plants will flourish at certain times of the year, so jumping forward to fall will see mushrooms sprout from the forest floor. Between seasons flora may behave differently: David teases a puzzle that involves a snow-munching plant. 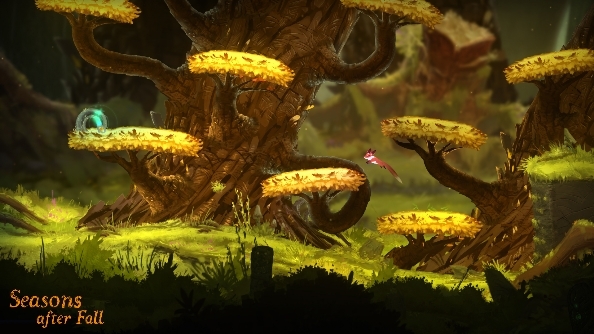 The forest is also inhabited by strange, alien-like creatures, and understanding how they behave and react to the changing of seasons is core to the experience. It’s important to note that while the creatures in the forest may be adversaries in terms of blocking your exploration, they’re not there to harm you. Seasons After Fall has no combat at all, and no enemies to speak of (at least in the traditional videogame sense). It’s a cerebral game focussed on telling a story and experiencing emotion, with little to distract from that. The vision of the project sounds similar to that of Never Alone, but David notes Brothers: A Tale of Two Sons as a marker for the sort of game Swing Swing are looking to make. David explains that the story will be painted in far more shades than black and white, and that certainly applies to the artwork, too. Géraud Soulié, the project’s only artist, had to re-create every one of the game’s nine different environments four times over for each of the different seasons (“I can see why no one else does that!” laughs David). It’s all accompanied by music from composer Morusque, recorded by a live string quartet. Evidently, this is quite the artistic achievement. It’s clear that David has passion for Seasons After Fall, as anyone would do for their debut project. The setback the game suffered is no doubt frustrating, but after releasing two other titles, it’s time that Swing Swing Submarine returned to their origins and finally let players loose in their beautiful, haunting forest. And thanks to Focus, the secrets of the Guardians will be revealed before 2016 sees its final season.